Is your work history in the resume lengthy, dull or uninviting? Best Work Experience definition advocates that this is the pivotal-most section that must pull the manager to read and rank you as the best candidate. The work experience form is rejected easily if your descriptions are haphazard or filled with questionable jobs. Listing your years of job history can be trickier if you’re a seasoned professional with extensive work experience as lengthy resumes also skip the hiring desk quickly. You must assess diverse work history resume samples to learn which experiences to include, cut-off or rate above another in your professional resume. To keep the manager glued to your profile, effective presentation of work history description is indispensable; and, it applies mostly to the early years of the work history. Career experts recommend that professional resumes must restrict the work experience section to jobs within the frame of ten to fifteen years to accommodate the technological disparities between then and now. However, not every work history underlines your proficiency in the job you’re applying for. Work experience rule is to mention the relevant-most jobs that prove you efficient with alongside the timeline. If you must refer to your earlier jobs, condensing the same into a point with the Job Title, Company Name and Time stamp fit a professional CV. At the end of the day, there is no hard-and-fast rule when referring to work experiences before ten years and beyond. The aim is to review the job description and contour your work experience around it without getting rejected at all! The age that we live in is rapidly changing, and so are our responsibilities or roles in the workplace. In the past fifty years, there are millions of new occupations added and deleted according to the National Bureau of Labor Statistics. As your resume must stick to your technical proficiency in current technology (unless required otherwise), your work experience template must highlight how well you qualify for the same. If your resume experience section refers to an older technical efficiency which is no longer beneficial to your current company, it is futile to list it in an official resume. For example, listing your experience as a typewriter mechanic in a mechanic’s resume will merely clutter the profile than adding to your efficiency of being a competent mechanic. If your resume experience format consists of more than one page of work history, it is wise to shortlist the vital ones and cut the others. You must begin by chronicling your work experiences based on its technical importance and relevance to the position offered. Hiring managers immediately reject resumes that have little white space or are crowded with haphazardly arranged data. As a professional, your first trait must be organization and the ability to cut clutter and fluff in a resume. Condense your points to quickly show the employer how you precisely fit the job profile. Age discrimination is a common factor that decides the fate of your resume. If you’re applying for a job that requires the candidate to be young or physically fit, your experience of 20+ Years in an intensive job will damage the resume. Removing older work history gives you a chance to prove your technical efficiency regardless of the age in the interview room. There is no universal law that resumes must not contain job references before 10-15 years. It is for you to decide if your amateur work experiences are worth exceeding the length of the resume or the patience of the manager. Provided that there is an ominous job that relates to your career graph and the current job, listing it as a brief point is clever. Your resume must strategically prove your technical background and professional efficiency through organized time stamps and resume experience achievements. It is smart to include your older work experiences and extracurricular activities related to the job than inadvertently show missing years in your official resume. If an older job proves your exceptional technical proficiency or innate relevance to the job, it is better to list it amongst higher ranking jobs. When a job experience past ten years highlights your professional background in a field, you must list it as the opening clause of your work experience section than downgrade it. The same gives the manager a chance to emphatically believe your professional traits. Hiring managers go through zillions of resumes every day before deciding on a few dozens to invite for the interview. This roughly gives your resume a few seconds to impress and lure the manager into the reading rest of your best skills. Avoid jobs that might make the manager take your resume for a run-of-the-mill candidate. You must actively include older jobs that emphasize your efficiency in a condensed format. According to Michelle Aikman, from National Resume Writers Association, “My rule of thumb is to consider how important the experience is to convey your ability to do the job and whether it is absolutely critical that you communicate your qualifications or past experiences with a timeline attached to it”. Hence, your resume experience details must highlight the past jobs that make you the perfect candidate. 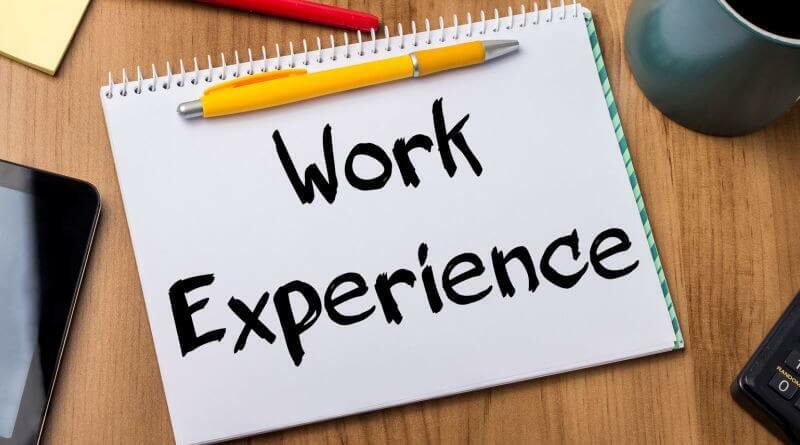 Typically, you must restrict experiences prior to ten or fifteen years; but if it adds to your professional value for the specific job you’re applying to, add it to the work history right away.